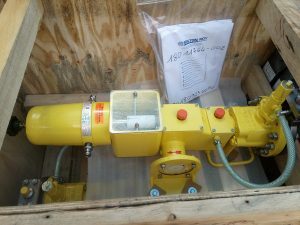 BOG delivered Milton Roy pumps to Chevron Nigeria Limited. The pumps were delivered to the Chevron Warehouse in Onne, Rivers State in March 2019. Milton Roy specializes in developing and marketing chemical dosing pumps, chemical dosing. packages and mixers. BOG is the exclusive representative of Milton Roy Europe (MRE) in Nigeria. Milton Roy dosing pumps are reciprocating positive displacement pumps with a variable flow rate that can be adjusted when the pump is running or stopped. They are used for accurate addition of liquids to continuous or batch processes. 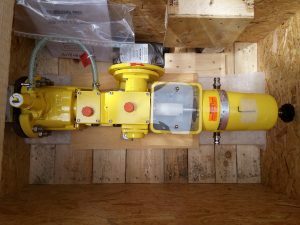 The delivered pumps were manufactured to the specification of client, as any discrepancy in the specification will render the pumps inapplicable for the required task. Chevron was delighted with the delivery; a further testimony to BOG’s commitment to offer world-class technical support to help companies optimize their operations in the upstream sector of the oil and gas industry. All 3 pictures: Milton Roy Dosing Pumps delivered to Chevron Nigeria Limited (CNL) warehouse in Onne, Rivers State.